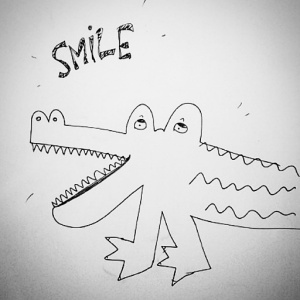 Write a goofy, rhyming bedtime story poem about a misunderstood crocodile. But the others didn’t know. When they saw him, they’d always run and hide. People feared the worst possible fate. Chewing not an option or choice he preferred. And what came next is what scares people away. Smile suddenly heard a POP! And his jaw was locked, right at the joint! But even an inch it would not close. Alarming all around when they saw his pose. A dentist, a vet, or even a nurse. That he couldn’t move his mouth at all! And certainly wasn’t trying to put up a fight. Cooing calming words, humming a lullaby instead. Quietly lay down on the ground. The lock on his jaw unlatched and was gone. Making Smile and Sally, for a moment, like twins.